Emac 167 3.1 3.3 Political Science Female No MD 2010 Accepted Submitted 2/28. 1st choice!!! vivconnagal 163 2.7 2.9 English Female No NC 2010 Accepted It's in Hartford. nmlf16 162 3.9 3.9 Legal Studies Male No FL 2012 Applied Withdrew. WhatTheLawSchool 162 3.7 3.7 History Male No UT 2010 Waitlisted Withdrawn. capitalacq 161 3.6 Math Male Yes CT 2011 Applied hoping! lic06003 155 3.5 3.4 Political Science, History Female 2011 Accepted Will be attending!! 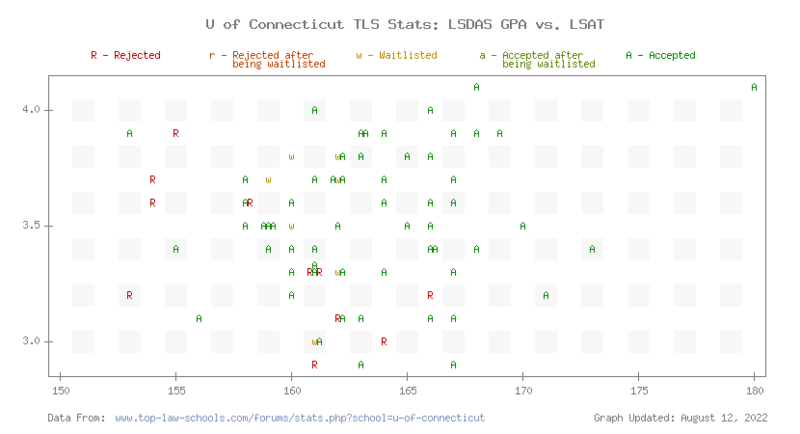 Be sure to check out the TLS Profile on U of Connecticut Law.